Moussaka cries out for a red but not too powerful one otherwise the effect will be to add to the richness of the dish. (Cooked cheese, by the way, is much easier with red wine than uncooked cheese is). 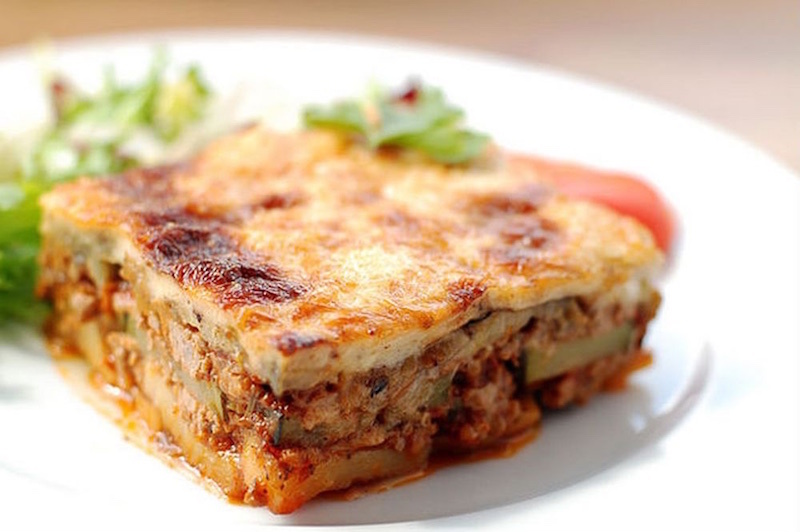 We’d be looking for a medium-bodied red with a touch of acidity and would be most likely to find it in the southern Med, indeed in Greece itself whose earthy dry reds suit the strong, gutsy flavors of mousaka perfectly. The indigenous agiorgitiko (St George) from any of Papaioannou Estate or Skouras Winery – would do the job. Other good options, in case you would be looking for a white, the indigenus Moschfilero (Boutari Paraga or Mantineia Tselepos) or the up-coming star coming from Crete, Vidiano.